This is by the way the 1-year anniversary of the MusicCabinet project, I started working on it last Christmas. Happy holiday everyone and thanks for good ideas, code patches, help and bug reports! Awesome - what a great Christmas present - thanks so much for all of your hard work, hakko! Will this work for those who are currently using the MadSonic mods? I'm running 4.8 beta 2 (3292) and would like to test this out as well, to see how well it works on my system. What are some of the possible issues I should look out for? gurutech wrote: Will this work for those who are currently using the MadSonic mods? What are some of the possible issues I should look out for? This isn't really a "mod", it is a full replacement of your current Subsonic server. So you have to make a choice of which one fits your needs best (or run both). MusicCabinet is designed for people with large, well tagged music libraries. Streaming video is not prioritized. This is built to help explore your music collection, by creating good playlists, giving advice on new recommended artists and missing albums in your library, showing related artists, browsing and searching by genre etc. Common issues: your library is browsed by tags in the main mode, so if your folder structure is very important to you, this might not be what you're looking for. Some options from vanilla Subsonic are removed (LDAP, WAP interface). I haven't tried installing on top of MadSonic, but make a backup of your settings before trying and you might need to remove C:\Subsonic before installing, I don't know what changes have been made to the database in the MadSonic code base. Make sure to set up a last.fm account if you use it to get full features. Thank you and congratulations for that 1-year anniversary! hakko wrote: I haven't tried installing on top of MadSonic, but make a backup of your settings before trying and you might need to remove C:\Subsonic before installing, I don't know what changes have been made to the database in the MadSonic code base. Make sure to set up a last.fm account if you use it to get full features. 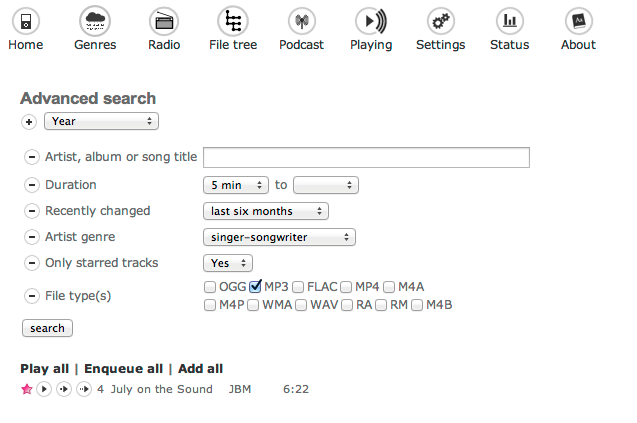 I like how this would allow easier creation of playlists and such, which is what I'm really looking to do. I have a weird setup, where I use Windows Media Player to search and re-tag (update) my music, and then I use iTunes to create "Genius" playlists, based on a song. Then I export these playlists from iTunes into *.m3u8 format, and convert all the \ to / and replace the path strings in the exported file, then import those into MadSonic. That's the reason I started working on this project, originally. I tried various ways of exposing iTunes from home to work (to get those Genius playlists) but nothing worked really well so I just decided to build my own Genius playlist system within Subsonic. I actually use at home too, now.